A number of disgruntled readers of my piece on Donald Trump have reached out to me with angry emails. My essay appeared in the Syracuse newspapers a week or so ago. If you teach Native American history, you have likely encountered these sentiments before. If you are a student in a Native American history class, it is a safe bet that some of your classmates share these views. They are not uncommon. I heard them when I lived in Montana. 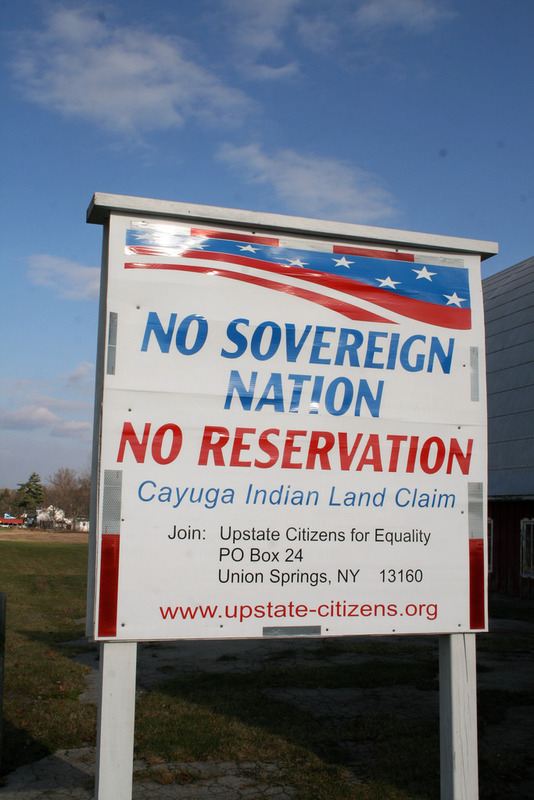 They were for many years the lifeblood of the anti-Indian sovereignty group Upstate Citizens for Equality, which opposed Indian gaming and other commercial operations in New York state and Indian land claims. Some of their signs still dot the roads coursing through New York’s Finger Lakes region. We could, I suppose, dismiss these views as anti-Indian racism. That, in my view, would be a mistake. We need to engage. We need to educate, and tackle views such as these head on. Our students, after all, learn nothing about concepts like tribal sovereignty and the place of native peoples in the American constitutional system and, at best, little about Native American history. At times, views like these are expressed with such vehemence that we might feel as if we are casting our pearls before swine, but I believe that these are teachable moments. And I would argue that we let these opportunities pass us by at considerable cost. When I face views such as these, I try to concede a few points. In other words, if one sets aside the entire historical experience of the native community in question–which historians are always reluctant to do–it might seem that native peoples have certain “advantages.” But these so-called advantages are often misunderstood, or based upon fallacies, or a lack of information about the constitution and American Indian history. Sometimes I find this stuff difficult to explain. Sometimes I think the people who write to me really do not want to hear a history lesson, or an explanation for how things came to be. So I begin with the fact that native peoples belong to polities that predate the United States. Under American constitutionalism, native nations retain by virtue of their inherent sovereignty the right to govern most of their own affairs, on their own lands, so long as they have not explicitly lost those rights by virtue of an act of Congress or a treaty, or implicitly because the practice in question is somehow inconsistent with their status as domestic dependent nations. I will point out that to a great extent they have lost criminal and civil jurisdiction over non-native peoples who own land on their reservations, but that they retain considerable power still. I point out that over the course of the last forty years the Supreme Court has weakened significantly the powers of tribal governments. So much for the Constitution. I also point out that the notion that “Indians pay no taxes” is an oversimplification. Native Americans pay federal taxes, even when that income is earned entirely on a reservation. States and localities do not have the constitutional right to tax economic activity by native peoples on Indian land. (The most useful discussion of this issue appears in Chapter 10 of Stephen L. Pevar’s The Rights of Indians and Tribes, (4th ed., 2012)). 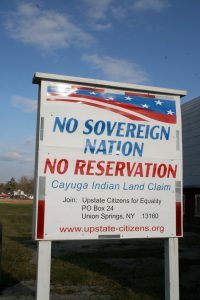 I am willing to concede that this might pose a competitive disadvantage to non-native businesses located in the vicinity of Indian reservations, but that this is not simply a product of “special treatment” or an “uneven playing field,” but because of the language of the Constitution which places Indian affairs under the control of the federal government. I point out that in a number of instances, Congress has allowed states to exercise its authority in Indian country. This is the case in New York State. I have been at this a long time. Racism towards Native Americans is a real thing. The inequalities experienced by native communities are significant. The statistics do not lie. New York became the Empire State, as Laurence Hauptman has so ably shown, through a systematic program of Iroquois dispossession. You could not have one without the other. The transactions through which New York acquired Iroquois land happened a long time ago, but these were transactions that violated federal laws the United States lacked the power and perhaps the willingness to enforce. The Supreme Court has held that these transactions occurred so long ago that nothing can be done to right these wrongs, but that does not mean that the rights retained by native peoples should be ignored. Give me a break. Look at the ground underneath your feet. If you believe that laws matter, that the Constitution matters, that the pledges in a treaty that guarantees to the Six Nations the right to “the free use and employment of their lands” matters, then drop the whining about what is or is not unfair. Please. I was writing about something else, a president’s name-calling that I considered racist. Stop sniveling about fairness. It is not a good look. It makes you sound racist.